(Cheek By Arse), a character from Jacmel carnival, who dresses in drag inside a sacred Vodou altar space before going onto the streets with his rara music group. 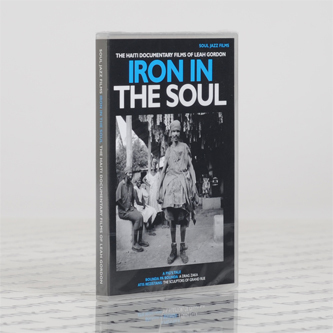 Language: Creole/English, English subtitles* "Soul Jazz Records / Films presents ‘Iron In The Soul’, a stunning new DVD collection of documentary films about the world of Haiti - Vodou, art and culture - by filmmaker and photographer Leah Gordon. Gordon’s photography book ‘Kanaval: Vodou, Politics & Revolution On The Streets Of Haiti’ was published by Soul Jazz Records / Books in 2010 to critical acclaim. This DVD is the latest addition to Leah Gordon’s work exploring Haiti’s surreal and fascinating cultural world. Similarly, Soul Jazz Records have amassed a growing set of Haitian releases, including ‘Voodoo Drums’, ‘Spirits Of Life: Haitian Voodoo’, ‘Rara In Haiti’ and ‘Kanaval’. With this release Soul Jazz continues their exploration of the rich cultural world of the Caribbean, with records, books and films from Jamaica, Cuba, Guadeloupe, Colombia and more, including releases such as ‘Mirror To The Soul’, ‘90 Degrees Of Shade’, ‘Gwo Ka’ and ‘Black Caribs Of Belize, to name but a few. Leah Gordon is co-director of the Ghetto Biennale in Port-au-Prince, Haiti, as well as curator of the Haitian Pavilion at the 54th Venice Biennale and co-curator of the ‘In Extremis: Death And Life In 21st Century Haitian Art’ show in 2012 at the Fowler Museum, UCLA."